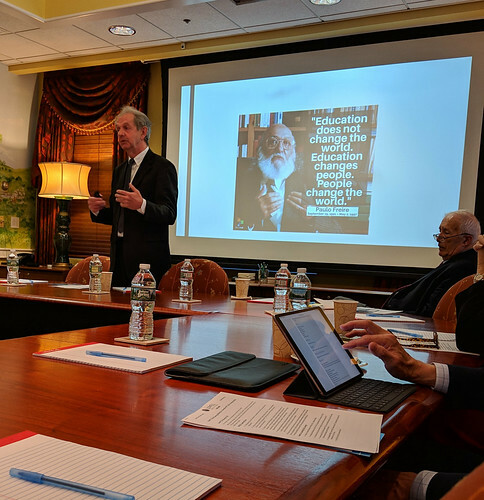 Last week I attended a presentation by UMass Lowell professor (retired) John Wooding in which he provided an update on his quest to make Lowell a UNESCO City of Learning. That designation is applied to cities around the world – there are 140 so far, but none in the U.S. – that recognize and promote lifelong learning. 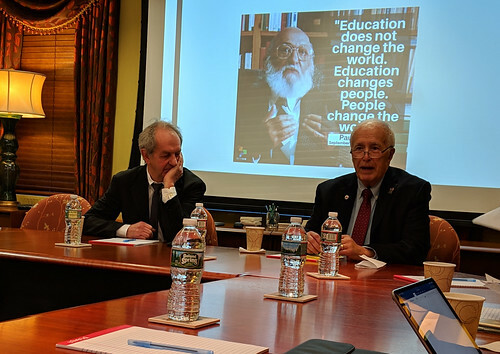 Lowell has a head start in this pursuit, because it is almost identical to Pat Mogan’s vision of Lowell as an “educative city”, a classroom without walls. Mogan’s efforts helped pave the way for the creation of Lowell National Historical Park while also building upon a deeply rooted commitment to learning and education that stretches back to the city’s founding. This effort to gain official recognition of Lowell as a City of Learning has much going for it. Perhaps the foremost advocate of this effort is Mayor Bill Samaras who hosted last week’s presentation. Many other political, educational, business and non-profit leaders are also onboard. One thing that makes this effort achievable is that much of what is needed is already being done. Lowell is a center of education with UMass Lowell, Middlesex Community College, the Lowell Public Schools and the many other schools in the city. But so much learning also takes place outside the walls of the classroom whether it’s small classes run by a nonprofit, talks and tours around the city, or just informal learning that happens every day. One of the benefits of living in such a diverse city is the ability to learn much about the world and its culture from each other. At this point, the main task for the City of Learning advocates is to help promote and package things that are already going on. For instance, in July, there will be an emphasis on music and folk life built around the Lowell Folk Festival. August will be devoted to all things Asian which ties in to that month’s Southeast Asian Water Festival. And October will highlight literature and poetry in connection with the Lowell Celebrates Kerouac festivities. So for now, just be aware of this undertaking and watch for future announcements about specific City of Learning events. I love this idea. When and if I can do anything to help, count me in!